The "Class Scrap" has faded into memory. The "Greased Pole Fight" no longer exists. "Cultures & Traditions" has replaced "Western Civilizations" as an all-College course. Until this fall only one fraternity’s pledges wore pots, and they’re almost never called "Rhynies." And nobody goes to class on Saturday mornings these days. 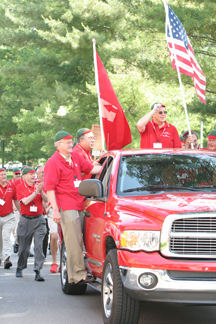 Traditions at Wabash College come and go, but a few classics endure. No matter if you graduated in 1957, 1977, or 2002, chances are that you participated in that rite of passage known as "Chapel Sing." Some of you sang Old Wabash and some of you only learned to grunt it. But you can all proudly stand and sing it word-for-word after the football team scores a touchdown. Come back to campus June 1-3, 2007 for the Big Bash at Wabash! There will be plenty of TWR and telling of old tales, but the highlight of the weekend will come Saturday morning when reunion classes compete in the Alumni Chapel Sing competition. Nobody will leave with a "W" haircut and none of you need to paint your faces. Just brush up on the lyrics to Old Wabash and come ready to have a great time. The Alumni Chapel Sing is just one of many exciting, family-friendly events during Big Bash Weekend. We need to hear from you no later than May 21, 2007 in order to reserve a spot for you in what promises to be the best Wabash reunion weekend ever! Click here for all the details and to sign up for Big Bash ’07. Dust off your pot, straighten out your golf swing, and flip through some old yearbooks. We’ll take care of all the rest!